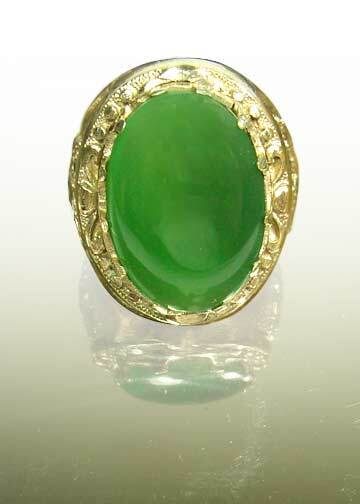 You will look like someone who is very rich with this big jade look a like bluff stone. When gemologists first see this they say what a lovely piece of jade but Day Gems knows better.This piece of chalcedony is set in a gold plated metal ring. Since this picture we have improved the ring even more by polishing the chalcedony and re plating the ring a second time to a more gold color. Impressive and majestic despite the simple design of the ring. The fact is that, this chalcedony gemstone has a classic appearance and really does not need any fancy design to make it look impressive. Approximately dimensions are as follows: length 21mm, width 14.5 mm and weight is 9.64 grams / 48.2 ct. Ring size 8. This ring comes with a FREE lab identification / origin report.